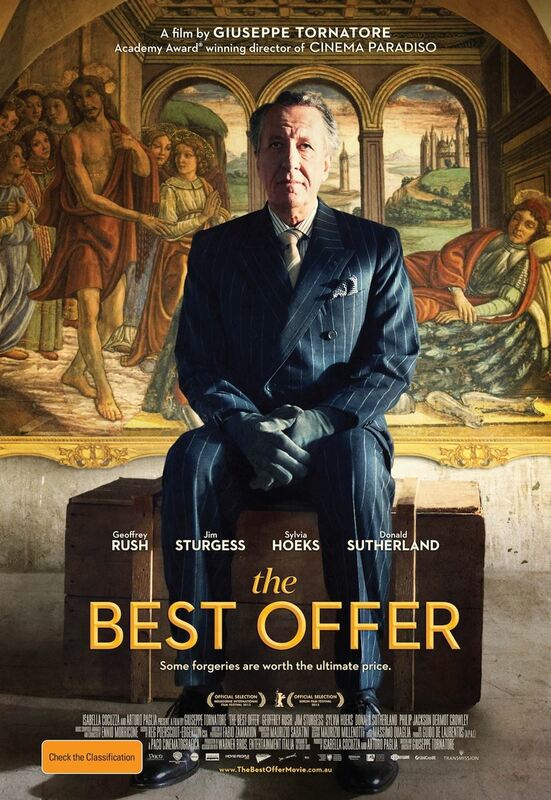 "The best offer"/"La migliore offerta" is a film by Giuseppe Tornatore, the Academy Award winning director of "Cinema Paradiso". After the amazing "La sconosciuta" Tornatore is back to tell a story of love and mystery creating a gripping movie. For "The great offer" Tornatore wanted a international cast as Geoffrey Rush (winner of the "Triple Crown of acting: the Academy Award, the Primetime Emmy Award and the Tony Award) and Jim Sturgess (appeared in Across the Universe, 21, Crossing Road, Cloud Atlas). The film is set in Europe (Trieste, Wien, Rome, Milan and Bolzano) and it tells about Virgil Oldman, an aging and esteemed, but somewhat eccentric, managing director of an auction house. His life turns upside down when he meets Claire Ibbetson, a girl that wants to auction off the large collection of art and antiques lefts to her by her parents. But Claire has a "big" social problem. Between art, suspance and feeling the movie is flowing fast leaving the spectator without breath.